Parents/Guardians are free to meet the Principal or any teacher by prior appointment with the class teacher. Whenever corresponding with the School, kindly quote full name, class and section of the student. Parents/Guardians are not expected to visit their child/ward in classrooms anytime during the school operating hours, unless they are invited by the School. All belongings of the students should be carried by the child. No delivery of items is permitted in the School. Kindly ensure that the child reports to his/her classes on time. No student will be allowed to leave the School early, except in case of emergency or in case the student is unwell. Such leave shall be granted on the discretion of School Principal’s approval. Kindly ensure that your child does not carry any valuable item to the School. No mobile phone is allowed to be carried to the school by any student without explicit and written permission of the respective class teacher. Parents should ensure that the child is dedicating time towards his or her home-work and gets complete set of books as per the prescribed time-table and booklist. Private tuitions are strictly discouraged. ‘6-day system’ of time table is followed by the School. Students need to maintain over 80% attendance for each term in every academic year. It is highly recommended that students should attend first working day and the last working day of a term. If a student is absent due to illness or any other valid reason, the class teacher or coordinator must be informed about it immediately by the parent/guardian. Leave should be obtained well in advance through an application duly signed by parents in the school diary, which shall be forwarded by the class teacher. Medical certificate from a registered medical practitioner is mandatory on the first day the student reports back to school after sick leave of more than two consecutive days. A student returning to school after suffering from an infectious or contagious disease must produce a fitness certificate from the doctor permitting him/her to re-join classes. Students are expected to respect the property of others and of the School. Each class will be responsible for looking after the respective classroom, including any movable items. No students should scratch/spoil/break or damage any School furniture, write/draw anything on the walls or in any way damage things belonging to others. Damage done, even by accident, should be reported at once to the appropriate authority. Any damage done shall be made good by the offender. No books (other than text books, reference books or library books), magazines or paper must be brought to School without written consent of the class teacher. Any knives, crackers, water-pistols, explosives or any other lethal object which may cause threat or injury or damage to School property are strictly prohibited to carry to the School premises. The School is strictly against exchange of any article or lending and borrowing of money. In case of any loss caused, the School shall not be held responsible. It is advised that students at all time must ensure cleanliness and do not litter or throw rubbish anywhere in the School premises or outside it. They must use the bins provided. Running, playing or making noise affecting others inside the School premises is not permitted. 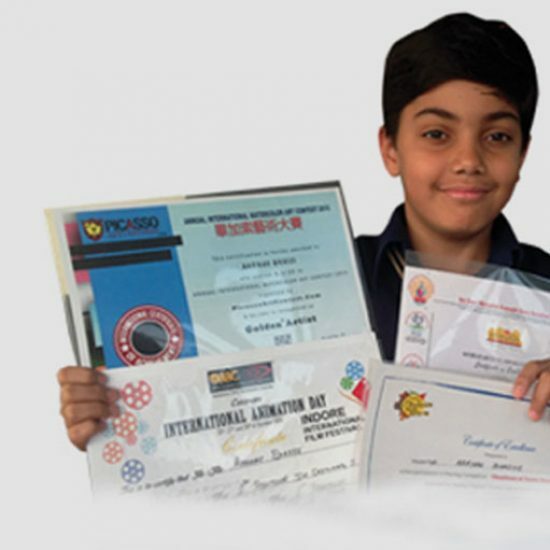 The School allows only English as the language to be used for communication within the School premises, except for the time devoted for classes or activities conducted for/in other languages. No student can leave the School premises during school hours without prior permission of the Principal/Head of the School of the person authorised by the Principal/Head of the School. On obtaining permission to leave, entry must be duly made in the log book before leaving the School. All students should behave in a courteous manner, wherever they go. They should always remember that the School is judged by the conduct of its students. The School reserves the right to dismiss any student whose diligence or progress in studies is steadily unsatisfactory or whose conduct is harmful to other students or whose parents/guardians show little interest in the progress of their children/wards. Irregular attendance, insubordination to teachers, habitual inattention to school work, obstinacy in word and deed, wilful and repeated breach of school regulations, immorality, contempt of authority, damage to property: any of these shall always be a sufficient reason for immediate dismissal. Only those students who maintain the required attendance as per the guidelines mentioned will be allowed to appear for examinations. A student caught using unfair means, and/or receives or gives assistance in any form during tests/exams will result in suspension from the School. Repetition of the same will result into expulsion from the School. 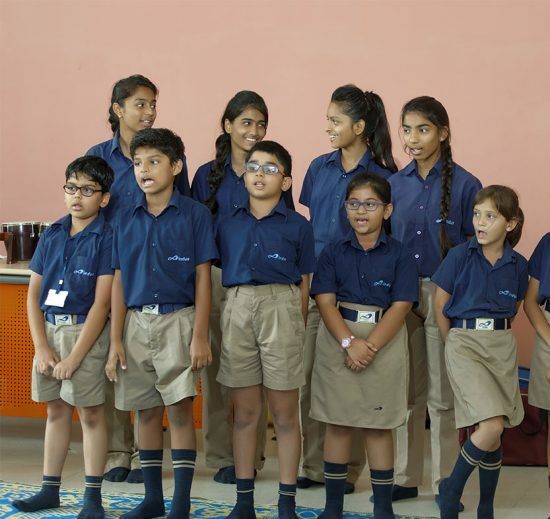 All students must take part in physical exercise, games, sports and all other activities of the School in order to learn sportsman spirit, boost self-confidence and develop physical strength. Students are required to wear proper uniform and display their Student ID Cards at all times. All students should reach the School in time. Appropriate language must be used at all times. Use of motorised vehicles in the School premises is strictly not allowed. Bullying or ragging is completely prohibited. 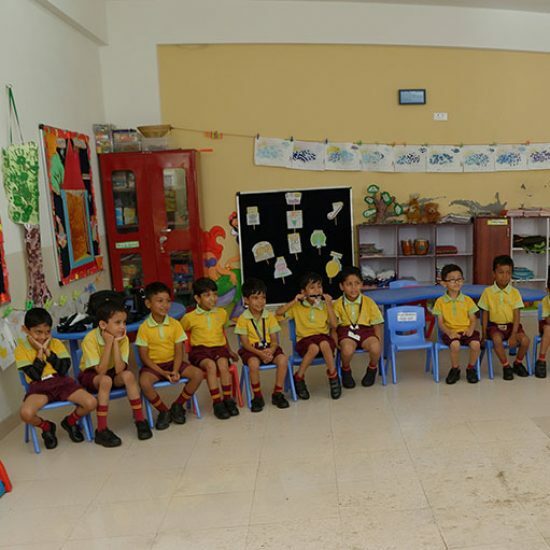 High standards of discipline to be followed in the School premises at all times. The School reserves the right to suspend, rusticate or expel any student not following the code of conduct laid down by the School. Students arriving to the School later than the designated time will be sent home after three written warnings. Parents are required to sign the punctuality record in the students’ handbook. In case the student’s ID card is misplaced or lost or damaged, the parents must make a written request for a duplicate card to the Class Teacher. The School will issue duplicate ID Card for Rs. 200/-. Promotions are granted on the basis of performance in classroom and in the examinations conducted during the year. Consistent neglect of any subject will not be condoned. A student who fails twice in the same class will be obliged to leave the School. The academic evaluation of students will be done on the basis of two Terminal Examinations and two Unit Tests before every term. The marks of Unit Test are added to the final evaluation. Students need to fulfil the attendance criteria of 80% attendance for each term in the academic year in order to be considered for a promotion. If a student is absent for an assessment for any reason, he/she will be marked absent. No retest will be conducted, unless it is a serious medical case. Parent Teacher Interaction (PTI) is held after each term assessment. Details of all meetings are issued in circulars to parents/guardians. The School expects parents to attend all the PTIs held during the year. Students need to accompany the parents/guardians in School uniform for each PTI. Report Cards will be handed over to parents/guardians only. Parents are welcome to meet the teachers on any working day during School hours through a prior appointment that may be made through the diary and will be coordinated by class teacher. Parents/Guardians are requested to pick their children/wards from the School within 15 minutes of the closing time. The School considers it to be prime responsibility of parents/guardians to ensure that the child is healthy at all times and extreme care must be taken about his/her food habits. The School encourages only home cooked food and discourages junk and fast food. Parents must not send a child empty stomach to the School and must ensure that the child carries daily a lunchbox containing healthy food. School fee must be paid on time as per the timelines communicated to the parents/guardians via the Fee Policy. Fee will be charged for all 12 calendar months. Kindly refer to the Fee Policy for the exact amount to be paid. No student will be allowed to appear for the examination unless all dues are cleared. Penalty as mentioned in the Fee Policy will be charged in case fee is paid after the stipulated date. Incomplete payment of fee will be treated as non-payment of fee and will be subject to a late-fee penalty. If there is a regular delay in fee payment, student’s name will be struck off the rolls. Parents/Guardians will then have to apply for re-admission. Every application for withdrawal of admission and issue of Transfer Certificate should be made in writing by the respective parent/guardian. If a parent/guardian needs withdrawal from the School on 31st March of a particular year, then the notice of withdrawal shall be given on or before 1st Jan of the same year. If the notice of withdrawal is given on 31st March of a particular year, then full fee (except Lunch Fee and Refreshment Fee), shall be applicable and charged until 30th Jun of the same year. If the notice of withdrawal is given on 1st February of a particular year, then full fee (except Lunch Fee and Refreshment Fee), shall be applicable and charged until 30th April of the same year (two months of Full Fee of the class the student would be studying at the time of the withdrawal notice and one month Full Fee as applicable for the next academic year). No Transfer Certificate will be granted unless all the School dues are paid and ‘No Dues’ certificate is obtained from the cashier/librarian/laboratory assistant and respective teachers. A nominal sum of Rs. 100/- will be charged for every Transfer Certificate. In all cases of re-admission, full Admission Fee will be charged. Transfer Certificate can be obtained after one week from the date of fulfilling all formalities and submission of the application form in the School office. For the convenience of parents and the students, the School makes arrangements for pick and drop of students through its own fleet of buses or through an annual contract, explicitly on request from parents/guardians. Any unauthorised travel in School bus is considered as an offence and will lead to a fine of Rs. 500 per incident for the unauthorised traveller. Parents are required to provide complete cooperation with the School by ensuring that their children/wards report at their embarking points well on time, carry their ID cards with them all the time and behave in a disciplined and courteous manner. In case of any problem or any mishap, the parents are advised to avoid any altercation with drivers, conductors or support staff. They should immediately contact the School authorities on the phone number given on the bus, or the phone number given by the School Principal. The School will ensure appropriate action in such circumstances. For any information whatsoever, parents/guardians are expected not rely on any information that they may get from drivers or conductors. For information related to their children/wards pick-up or drop timing or working days, they should contact the School directly. The School optimises the routes so that all the travellers have least travel time. However, it must be noted that it is not possible to cater to certain individual requirements at the cost of time and distance. Students are not allowed to travel in any other bus route except their own route. However, they can do so only with permission from the School Administrative Officer or the School Principal. The bus drivers are authorized to stop the bus only at the designated stops. The bus will not wait for latecomers. The use of bus facility cannot be discontinued in the middle of the session. It may, however, be discontinued by giving 3 months’ notice or transport fee in lieu of the notice period. Application for request for change in transport in case of transfer/change of address should be submitted to the School Administrative Officer at least three months prior to the intended last date of travel. Acceptance of request for change in transport is based on route and availability of seats. Full month Transport Fee will be taken for availing transport in middle of the month.